During a recent gathering at home, a close family friend presented us with a suspicious looking red plastic bag containing 4 equally suspicious looking rectangular cardboard boxes. Since this friend is an ardent foodie, we instantly knew we were in for a treat. Contained in each cardboard box were 8 luscious looking original beancurd tarts, screaming to be eaten. Handle with care. Require refrigeration. Consume within 2-3 days. Best served chilled. Have you eaten Le Cafe beancurd tarts before? If you haven't, do yourself a favour and get a box as soon as possible. Each tart fits snugly in the cusp of your palm and is filled with the smooth silky goodness of beancurd with just a hint of sweetness. The crust is slightly thick but not overly crumbly (no pork or lard used) , boasting just the right amount of crunch and buttery goodness. Needless to say, these tarts became the highlight of our gathering and will be the highlight of many gatherings to come. If you like variety, the tarts also come in interesting flavours like ginko nut and white fungus. 1) Each tart cannot be purchased individually. Its either a box of 8 or nothing. Clever marketing ploy or economies of scale? With tarts these good-who cares. 2) Order in advance to avoid incurring the wrath of the owners, who purportedly can get quite nasty to walk-in customers during peak hours. It was one of those blah days where a good lunch is a "need" and not a "want". Egged on by some glowing reviews of the restaurant, my kaki and I decided to give ourselves a treat. Ambience: Pretty nice...we did not manage to secure indoor seats and were seated outdoors under a huge canopy. There was a hint of a breeze and a lovely view of the promenade. Service however left more to be desired. It was difficult catching the attention of the servers and the China waitresses sported deadpan expressions on their faces. 1) Alaskan King Crab Yusheng- The shredded Alaskan King Crab which came with the yusheng was miserly in portion. We could barely locate the morsels of flesh from the mountain of shredded vegetables, much less taste its purported sweetness. Whilst the restaurant was innovative with use of certain ingredients like dragonfruit, this was overall an underwhelming dish which did not warrant such a hefty price tag. 2) Seafood Deluxe Combination- We ordered a portion for one to share. The platter allows for a choice of 5 different kinds of seafood but we decided to stick with 3 (Hokkaido scallops, bamboo clams and salmon sashimi). All the items were served on a pretty leaf laid in a bowl of shaved ice. I found the salmon sashimi a tad too fishy and the bamboo clams dry and rubbery. Thankfully, the scallops saved the day, boasting a natural sweetness that can only be derived from very fresh seafood. 3) Australian Lobster with Vermicelli in Superior Broth- The lobster came deshelled, which is a pretty big plus point since I am one clumsy monkey. Presentation was lovely and the fiery orange broth was accentuated by lashings of green Chinese parsley. Stir in some chili padi for extra punch!. Unfortunately, the cook had left the vermicelli to soak in the broth for too long, resulting in puffy gelatinous strings that had absorbed at least a quarter of the precious broth. Pity. 4) Nian Gao- I love all things deep fried and battered, especially when done well. It makes the consumption of additional calories worthwhile. In this case, the nian gao was cooked two ways- i) battered and ii) dusted with shredded coconut "kueh kosui style". The former was a clear winner with its light crisp exterior which burst forth with gooey nian gao when bitten into. We could also taste chunks of sweet potato and yam within the filling.Whilst the nian gao dusted with shredded coconut was palatable and a creative take on traditional kosui, it paled in comparison to the real McCoy. we suspect it would have tasted better if it had been chilled for at least an hour before serving. Verdict: Alas, at the end of the meal, my kaki and I couldn't help but feel unsatiated. Perhaps the head chef was not in during lunchtime that day. Perhaps we should have ordered beer and crabs. Or perhaps we are just incredibly fussy people. In any case, we doubt we'll be going back to Palm Beach anytime soon. Ever since I received my complimentary Eat @ Meritus Card, I've been eating at Chatterbox almost once a week. Without the card (which offers 50% off the food bill for 2 diners), a plate of chicken rice could easily cost 30 bucks -and we haven't even taken into account the infamous Orchard Road parking charges! One other eatery worth exploring is Pine Court. Located at the topmost level of Meritus Mandarin Orchard, you can be assured of a panoramic view of the city landscape. More importantly, the food is above average, with a decent range of dim sum and ala carte dishes. EAT OUT WITH F3 @ Pine Court Chinese Restaurant at the Meritus Mandarin Singapore!! There IS such a thing as a free lunch! Every first Fri of the month, F-Cube eats out! Our next tasting will take place on Friday 5 March 2010 with Eugene Loh and All About Food's Janice Teo during lunch. Relish exquisite Cantonese cuisine in the elegant setting of the award-winning Pine Court Chinese Restaurant. Sample signature dishes by Pine Court’s new Executive Chef, Eric Yeo. These dishes will be available together with the new menu when it is launched in March 2010. Set Menu: 味 芝 奶 焗 鲈 鱼 扒Canadian Sea Perch baked with miso and mayo, 秘 制 大 虾 球 King Prawn with Chef’s secret recipe, 鹅 肝 牛 仔 粒 Beef Cubes wok-fried with foie gras, 螺 头 花 胶 炖 鲍 翅 Superior Shark’s Fin double-boiled with fish maw and sea whelk, 榄 菜 鲜 蟹 肉 炒 饭 Fragrant Fried Rice wok-fried with diced olive and fresh crabmeat, 人 参 芦 荟 雪 蛤 冻 Pine Court Dessert chilled hasma with ginseng and aloe vera. If you & a friend would like to join us for the complimentary tasting, email eugene@mediacorp.com.sg with your name, IC number, designation and company name. Only successful applicants will be notified. Priority will be given to listeners who have not joined us on this event before. Only successful applicants will be notifed. With Chinese New Year barely a week away, its hard to ignore the huge Chinese lanterns, blaring Chinese New Year music and sizzling smell of bak kwa. Will you be going to Chinatown this year? If you do not wish to risk being jostled around like a clueless sardine, go during lunchtime where you can comfortably soak in the atmosphere with relative ease. Just remember to slather on more sunblock! As always, the famous bak kwa shops are experiencing brisk business. Heck, there's even a bak kwa index devised by Bloomberg to track bak kwa prices during the lead up to Chinese New Year. Lim Chee Guan leads the pack with the priciest (and arguably best tasting) sweet meat. This year, I gave up queuing up for Lim Chee Guan bak kwa and defected to new kid on the block Kim Joo Guan. Despite its newbie status, Kim Joo Guan has already garnered a cult following after disclosing that it is a back door supplier of bak kwa to Lim Chee Guan. Kim Joo Guan's classy packaging trumps its competitors this year. Check out the funky gold box (for 1 kg purchases) and carrier. When I visited both Lim Chee Guan and Kim Joo Guan's outlets during lunchtime on Friday, both were already fully sold out for the day! I'm not much of a bak kwa connoisseur but everyone has differing opinions of how a good slice of bak kwa should taste. Folks who like thick and chewy slices would probably prefer Kim Hock Guan. I like Lim Chee Guan and Kim Joo Guan for their strong branding and thinner, juicier slices. However, my personal favorites are Bee Chun Heng (Gourmet Bak kwa) and Kim Peng Hiang (pineapple bak kwa). And what's Chinese New Year without a sumptuous meal and a round of mahjong thereafter? If you are clueless about mahjong and do not feel like splurging on an expensive meal, here is an alternative way to have your cake and eat it. 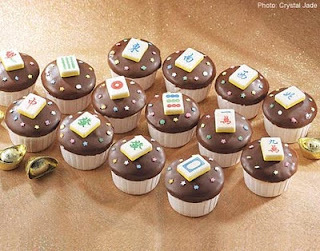 Step 1: Take part in Crystal Jade's mahjong cupcake contest and win a set of 14 chocolate cupcakes with edible marzipan mahjong tiles on them. There are 50 sets to be won and the contest closes on 7 Feb (today!) at 7pm. Step 2: Take part in Noel's CNY contest and stand to win a gourmet abalone seafood claypot from Jumbo restaurant worth SGD64. Contest ends on 12Feb10.